Deep within the catacombs beneath an Aztec temple, a Disney witch doctor is summoning powers that should be left alone. As terrifying wraiths and demons attack the Archives on the Walt Disney Studios lot, leaving a trail of destruction in their wake, Finn, Willa, Philby, Maybeck, and Charlene are summoned to Disneyland fresh from high school graduation. They must stop an enemy that hasn’t yet been clearly identified. In this, the final installment in the epic Kingdom Keepers series, betrayal and ambition push the boundaries of loyalty. Chasing scattered clues in pursuit of a long-lost icon—whose magic offers a fighting chance against an evil that Walt Disney himself created—the Keepers find their hearts and minds tested in the park where it all began. Bonds that once threatened to fray are renewed under the pressure for survival. As the five are pushed to their limits—and then beyond—feelings intensify behind self-imposed walls of well-kept secrets. With its dazzling action sequences and moments of touching intimacy, Kingdom Keepers VII: The Insider will leave listeners breathless, cheering, and biting their nails. It’s a winner-take-all battle for magical good—but then why is Disneyland burning out of control? 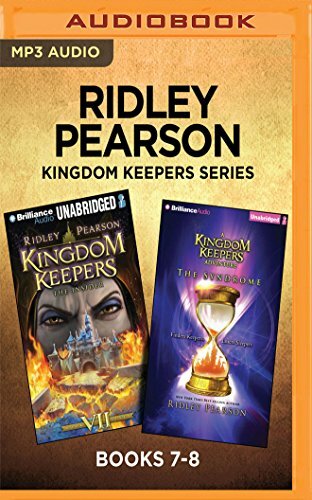 When Amanda travels east to Orlando on a hunch, she’s met with the worst news possible: Kingdom Keeper Finn Whitman and the other Keepers have gone missing. Calling on her own gift (she’s telekinetic), her sister Jess’s ability to dream the future, and their fellow Fairlie, Mattie Weaver, and her unexplained ability to read minds through physical contact, the three gifted girls must decide whom to trust and whom to fear as they work against time and threats they could never have imagined. If the Keepers are to be found and saved, it’s on them. A set of baffling clues have been left behind, but they only make things more confusing. As the Fairlies navigate treachery, deception, and the stubborn, unwilling parents of the missing Keepers, they face the perils of the past, the fear of the future, and the increasingly likely horror of losing their Keeper friends forever.